Tumble into playtime with a friendly elephant and a buildable animal parade! 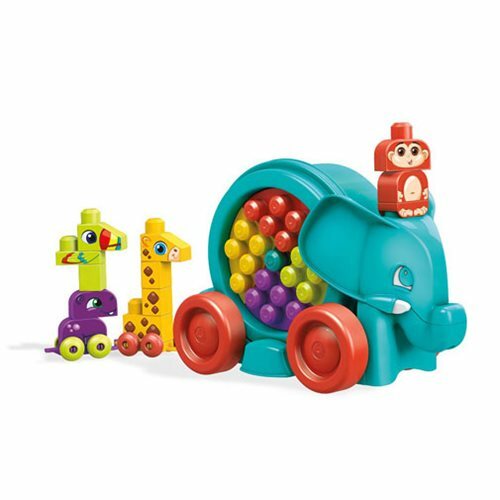 Roll out adventure from trunk to tail when you build with a friendly elephant and a parade of colorful animal friends. You can pull your elephant forward to make the building blocks spin inside the big, rolling tumbler. Then open the tumbler and use the lid as a building plate to build a hippo, monkey, toucan, and giraffe, matching each animal to the right color. Connect the animals together behind the elephant and pull them all along on their rolling wheelbases to create an animal parade! When the parade goes home for the day, cleanup is quick and easy when you store everything away inside the tumbler bin! There are sweet and vibrant colors in the assortment, but this item includes one Mega Bloks Elephant Parade Set. Which one will you get? Ages 1 to 5. Please note: Item selection is random. We cannot accept requests for specific items, nor can we accept returns on opened items. You may receive duplicates.